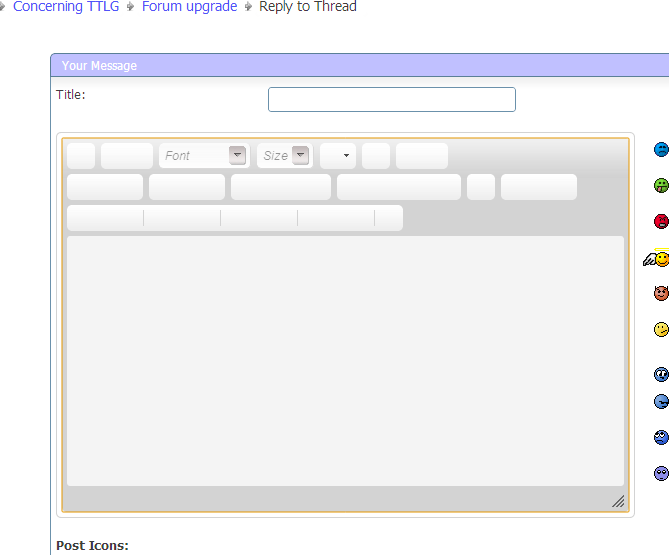 As part of some performance improvements, the forum software that TTLG is currently using will be upgraded tomorrow (26th August). This will require around three hours of downtime to allow backups to be made, the forum upgrade to run and the latest changes to be merged. This is currently planned for 1pm GMT. The most visible change is a new message editor which has some additional features including retrieval of text if there's a problem with posting. There are likely to be a few things that may not work immediately and it would help immensely if these could be noted in this thread after the upgrade has been performed. Sorry, but that's not planned at the moment. We know that some people want them enabled but there needs to be agreement on how to best handle them and there are some other things that are a higher priority (reducing delays when posting being one of them). I understand. Thanks Al, I appreciate your efforts. It took a little longer than expected for some of the database index changes to complete, but the forum upgrade has now been completed. There are likely to be a few tweaks over the next few days but nothing that should require as much downtime as today. As mentioned above, if you spot any major problems please post them here. Thanks. Thanks for putting in the work, Al! Appreciated. Also, I would humbly request to tweak a bit the layout of the Activity Stream page to resemble more the old What's New?. I'm put off especially by the density of content, there is far too much white now space IMO, and less contrast. The edit box seems to be completely broken as well. Strange - the icons in the new editor should display but you may want to force a full refresh (shift+refresh or ctrl+refresh) in case your browser has the old style sheet cached. I'll look at the activity stream layout later along with sorting the thread icons in individual forums and some other layout issues.. I don't have any problem with the edit box displaying but the "Go Advanced" link doesn't work.